The Speed gloves from Dynafit are a lightweight and flexible cut of high quality fleece, perfect for races and highly aerobic tours. The silicone printed grip zones on the palm offer good traction for climbing rock or holding strapless poles. 94% polyester / 6% spandex performance fleece has an anatomic cut and weighs only 60 grams (2.1 ounces). 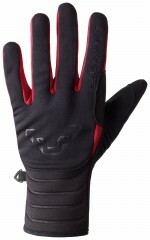 Tight fitting with brushed comfort interior make the gloves comfortable enough to wear on all day tours. Grip zone is made of sticky silicone and covers the palm, thumb, index and middle fingers. Sleek wrist is easily tucked under jacket sleeves and doesn't get in the way of overgloves.